No shake, rattle, or roll. 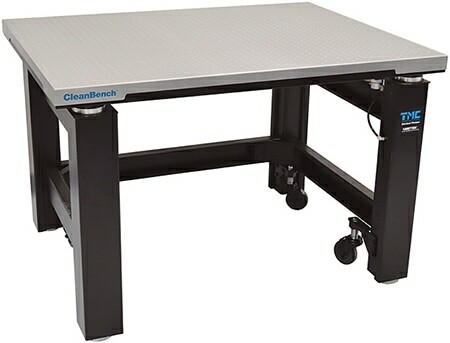 TMC introduces CleanBench™, the next generation of our industry standard 63 series vibration isolation lab tables. 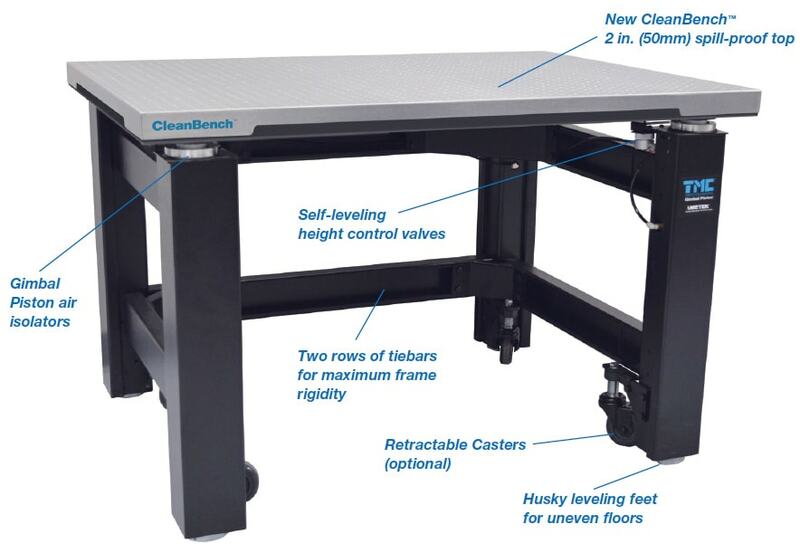 CleanBench combines the latest, patent pending, improvements to our table tops with our superior Gimbal Piston™ air vibration isolation system. CleanBench offers more stability, better ergonomics, guided thread lead-ins, and a more compact design. 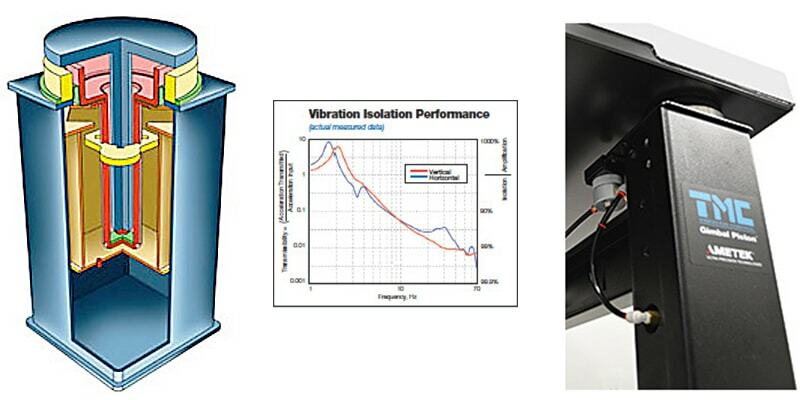 TMC’s industry standard vibration isolation lab tables lead the industry in performance and are ideal for a wide variety of applications including AFM, Confocal Microscopy, IVF, Patch-Clamping, Interferometry, and Metrology. Unique new table-top design (patent pending) combines the best features of TMC’s CleanTop® steel honeycomb tops with our ultra-stiff, damped, layered platform design. Greater stability, especially for small size tables. The low profile, high density tops lower the overall floating center-of-mass ensuring inherently stability, even for relatively top-heavy payloads. Guided thread lead-ins to align screws with tapped holes. The “bevel” shape eases engagement of the first thread. Ergonomics optimized for the seated user by minimizing the thickness of the table-top. Other designs either offer 4″ (100 mm) thick tops which awkwardly separate knees and elbows or sacrifice essential mass by offering a 2″ (50 mm) thick honeycomb top which does not have adequate mass for effective vibration isolation, especially for smaller table sizes. Gimbal Piston Isolators. Unique new table-top design (patent pending) combines the best features of TMC’s CleanTop® steel honeycomb tops with our ultra-stiff, damped, layered platform design. Ergonomics optimized for the seated user by minimizing the thickness of the table-top. Other designs either offer 4″ (100 mm) thick tops which awkwardly separate knees and elbows or sacrifice essential mass by offering a 2″ (50mm) thick honeycomb top which does not have adequate mass for effective vibration isolation, especially for smaller table sizes. Our Patented Gimbal Piston™ Isolator has been proven by independent tests to consistently outperform the competition. 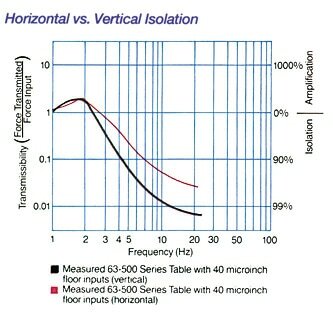 It achieves both horizontal and vertical isolation down to very low input levels. Thin-Wall Rolling Diaphragms. An integral part of the Gimbal Piston, the thin-wall, dacron-reinforced, rolling diaphragm air seals are only 0.020 in. (0.5 mm) thick and extremely flexible. They do not stiffen the spring as thicker rubber diaphragms do. Aluminum Height Control Valves. All systems are equipped with rugged aluminum height control valves. Virtually unbreakable, they are finger adjustable with no need for tools. The standard model maintains height to ± 0.050 in. (± 1 mm); the precision model, to ± 0.005 in. (± 0.1 mm). Internal Piston Travel Restraint. Unique in the industry, TMC provides husky, tamper-proof, built-in piston travel restraints. The restraints are completely independent of the table valves and have been ram-tested at forces above those produced by the pistons operating at full pressure. 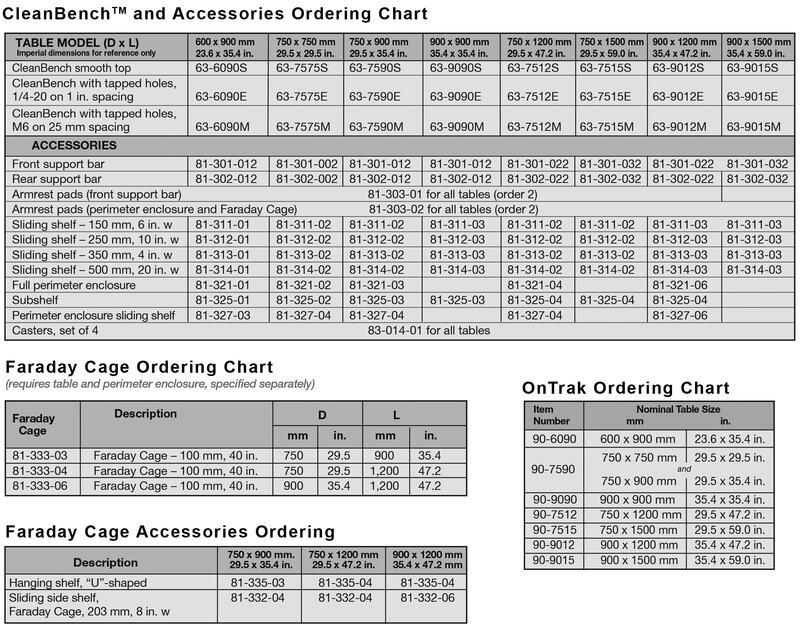 They cannot be decoupled accidentally and do not interfere with setting up and using the table, but simply protect against over­travel without the use of external bars that create hazardous pinch points. Heavy loads, including the top plate, can be safely removed from a table in full operation. Tiebar Gussets. 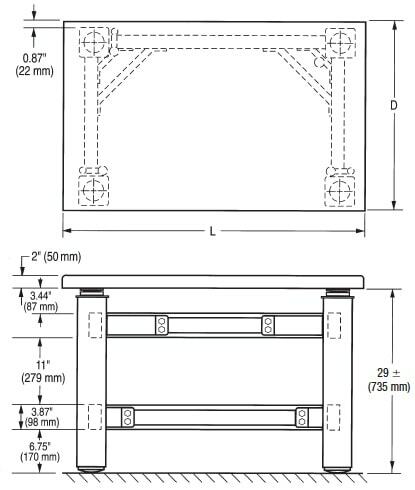 Exclusive TMC tiebar gussets increase table frame rigidity. They compensate for the elimination of the front tiebar in order to provide kneewell space. Rugged Built-in Leveling Feet. Table legs include built-in fine-thread 3 in. (75 mm) diameter screw jack levelers with 1/2 in. (13 mm) travel, provision for external adjustment, and a handy adjustment wrench. The base is a solid, slightly domed shape to assure solid, wobble-free contact with sloping or irregular floors. Superior Table Tops. Our standard laminated tops provide an attractive stainless steel ferromagnetic working surface with highly damped, high stiffness construction at low cost. For applications requiring the ultimate stiffness and damping or mounting holes, specify our patented CleanTop® II honeycomb top. TMC’s proprietary smooth “laminated top” construction has been the ideal table top for small, desk-style vibration isolation tables. These 2-inch thick (50mm) platforms which incorporate sandwiched layers of steel and core material rigid epoxy bonded into a seamless, stainless steel shell with rounded edges, are ideal for users who do not require a grid of tapped holes. Users desiring a grid of holes to bolt-down their payload or positioning equipment have had to settle for a “scaled-down” steel honeycomb optical top construction. Though such tops provide a grid of holes, they are bulky, raise the center-of-mass of the payload reducing stability, and are less ergonomic for the seated user. The CleanBench breakthrough offers versions of TMC’s laminated design whether or not a grid of tapped holes is desired with no sacrifice in performance. The new, low-profile top offers superior damping, stiffness and flatness in a easy to clean stainless steel shell. A unique core cross-section allows the design to be offered with a smooth surface or with a grid of imperial (1/4-20 on 1-inch) or metric (M6 on 25mm) tapped holes. TMC’s proprietary method of forming the tapped holes results in beveled lead-ins, which eases thread engagement and allows for a full three threads. Designed specifically for desk-style workstations, these tops are the ideal surface for small vibration isolation tables. Structural Damping determines how quickly an excited resonance in a table top decays. The simplest way to measure damping is to hit the table top with a hammer and measure the decay with an accelerometer and oscilloscope or spectrum analyzer. 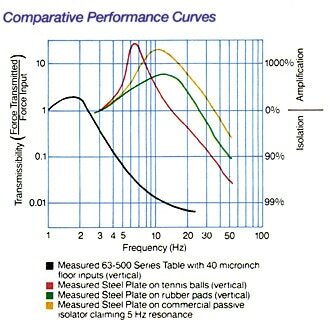 The height of a resonance peak in the “compliance curve” also measures damping. Compliance is a reciprocal measurement of the dynamic stiffness of a table top. 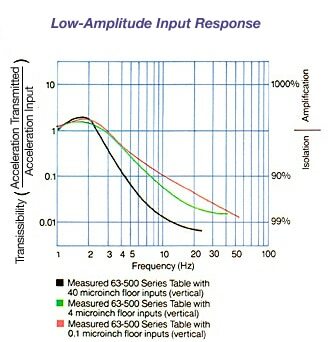 The data are obtained by inputting a measured force to the table top with a calibrated hammer and measuring the resultant acceleration (or displacement) with an accelerometer. Compliance is the ratio of displacement to force expressed as a function of frequency. The Gimbal Piston™ Air Isolator provides outstanding isolation in all directions for even the lowest input levels. It is lightly damped and highly responsive to typical, low-amplitude ambient floor vibrations, yet achieves very high damping for gross transient disturbances, such as sudden load changes or bumping the top plate. The result is that Gimbal Piston Isolators provide superior isolation yet will virtually eliminate any gross disturbance within a few seconds. It can also stabilize isolated systems with relatively high centers of gravity without compromising isolation. Our innovative Isolator allows a thin-wall, rolling diaphragm seal to accommodate horizontal displacement by acting as a gimbal. Instead of using a cable-type pendulum suspension, the Gimbal Piston Isolator carries the load on a separate top plate that has a rigid rod extending down into a well in the main piston. The bottom of the rod has a ball-end that bears on a hard, flat seat. The result is an inherently flexible coupling which allows horizontal flexure in the isolator as the ball simply rocks (without sliding or rolling) very slightly on the seat. The approach works extremely well, even with sub-microinch levels of input displacement, because the static friction is virtually the same as the rolling friction. Horizontal motion is simply converted to the usual vertical diaphragm flexure but out of phase: one side of the piston up, the other down, in a gimballike motion. Bearing Slip Plates. 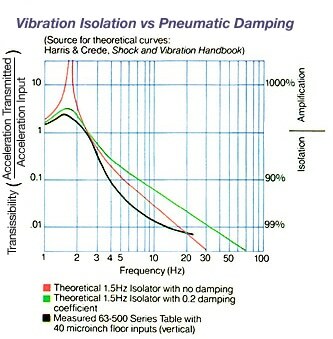 In theory, bearing slip plates should allow horizontal isolation by their decoupling effect. In practice, for such a design to work at low amplitudes, it would require precision ground, hardened bearings with impossibly small tolerances. The commercially available versions cannot overcome the static frictional forces at low amplitudes to get the bearings rolling at all. In addition, all such systems are difficult to align initially and easily drift out of calibration. Homemade Assemblies. Homemade Assemblies. Homemade isolation systems – often a steel or granite slab placed on rubber pads, tennis balls, or air bladders – will work only if the disturbing vibrations are high frequency and minimal isolation is required. While all isolators use the principle of placing a mass on a damped spring, their performance is differentiated primarily by spring stiffness: the stiffer the spring, the higher the resonant frequency. Thus, homemade solutions are limited by their high resonant frequency. 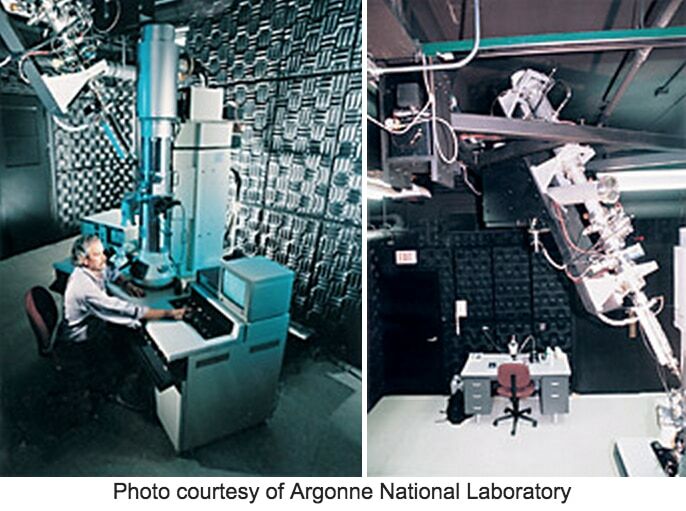 Comparative Performance ArgonneArgonne Photo courtesy of Argonne National Laboratory Gimbal PIston™ Isolators are routinely used for the most demanding electron microscope installations. Note: All CleanBench tops are sized in metric dimensions including both imperial and metric hole patterm versions. Metric patterns have a 12.5 mm (0.5 inch) border from the top edge to the first row of holes. The border on tops with imperial patterns will, therefore, be slightly more than 0.5 inch (12.5mm).